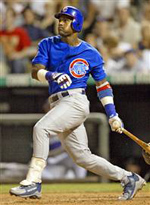 By the time the members of the 600 Home Run Club (“Say Hey” Willie Mays, Sammy Sosa and Ken Griffey, Jr. achieved their remarkable tally of 600+ longballs, it had become common for Major Leaguers to have numerous home and away jerseys, but they are still rare commodities …especially when personally signed or worn during the achievement of a significant landmark. 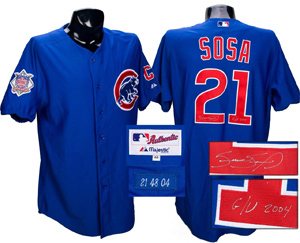 The shirt features Seattle’s team logo and "MLB 125th Anniversary" patches on each sleeve. Autographed in black Sharpie on verso, and accompanied by letter of authenticity from Junior himself. It was purchased in auction in 2004. 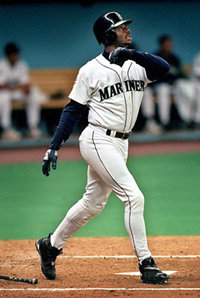 Now that he has retired from baseball and hit more than 600 home runs (630 career total), his game-worn shirts will undoubtedly begin to skyrocket in value…just like his career homerun count. 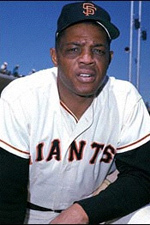 One of just a rare few Willie Mays jerseys ever to be made available at auction, this grey pull-over style specimen worn by the game's greatest all-around player during his tenure as a Mets coach. On the chest is "Mets" in cursive style blue on orange tackle twill above his number, "24". 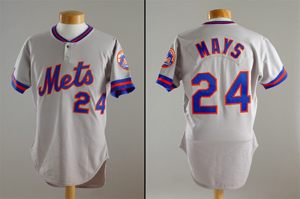 Across the shoulders on a matching gray nameplate is, "Mays," with "24" below. 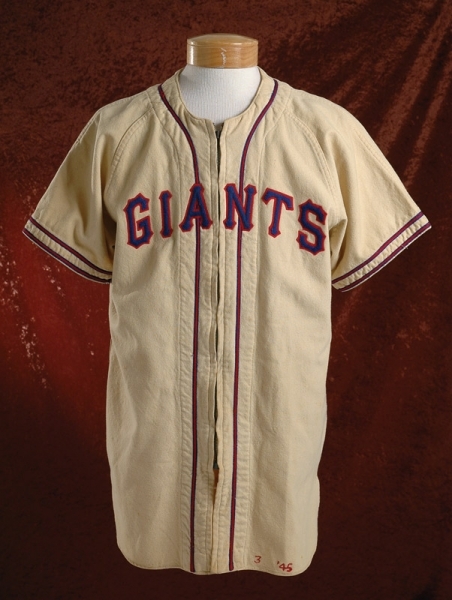 The left sleeve, trimmed with an orange and blue ribbed knit, sports a circular team patch and similar trim can be found around the neckline. Inside the front tail is "Rawlings [size] 42" tagging, "Set 1 1979" flag tag, and "42 79 24" blue chain-stitched plate. Measurable use can found throughout. 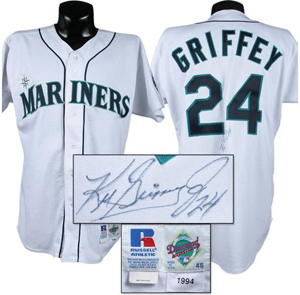 It sold for $4,000 in June of 2004.